More than 65,000 medical and healthcare professionals are expected to descend on the Dubai International Convention and Exhibition Centre this week for the Arab Health Exhibition and Congress 2011, which opens today (24 January 2011). At the Arab Health Congress around 6,000 delegates are attending 18 leading continuing medical education (CME) accredited conference streams. Working with the Cleveland Clinic ensures that the knowledge delivered at the Arab Health Congress is outstanding and that each conference is approved by the American Medical Association. The event will be offering the equivalent of 40 days of continuing medical education, ensuring that patients in the Middle East are receiving world class medical care and diagnosis. “This year we are launching three new conferences, on chronic respiratory disease, multiple sclerosis and oncology. Further evidence if it were needed that Arab Health provides an unrivalled opportunity for regional healthcare professionals to bring their knowledge and understanding up to date,” said Simon Page, Divisional Director for Life Sciences Middle East and Asia at IIR Middle East, the organisers of the Arab Health Exhibition and Congress. Key speakers this year include Dr. Mark Chassin, President, Joint Commission in USA, who will deliver the keynote on quality management. Philippa Robinson, former Implementation Director at the UK’s Department of Health, who will explain how she successfully reduced waiting times for elective surgery to 18 weeks for 60 million patients living in the UK, and Dr. Robert Fox, Staff Neurologist and Medical Director of the Mellen Center in the USA, who will be updating delegates on the latest treatment for Multiple Sclerosis. “Celebrating its 36th anniversary, Arab Health is by some considerable margin, the largest gathering of health and medical professionals in the region. The event, supported by Ministry of Health (MOH), Dubai Health Authority (DHA) and the Health Authority - Abu Dhabi (HAAD) features the world’s most comprehensive series of multi-track medical conferences covering the entire spectrum of healthcare provision, management and legislation,” added Page. Turning to the Arab Health Exhibition, 2,800 companies from 60 different countries are showcasing their latest products and services spread over 85,000 square metres of floor space this year. 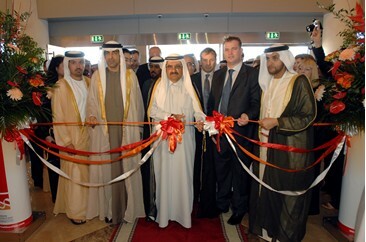 “Once again the Arab Health exhibition is a complete sell out – it has been for some time now. This year we have more than 300 new exhibitors and 30 country pavilions; with Argentina, Hong Kong, Japan, Singapore and Portugal all being debutants this year,” said Page. Given that independent industry analysts have estimated that healthcare spending in the region will triple over the next 15 years to $60 billion and that the number of hospital beds will double to162, 000, it comes as little surprise that the growth of Arab Health is consistent with the expected boom in the Gulf’s healthcare economy. A record number of 200 nominations from across the Arab world were received for the 2011 Arab Health Innovation and Achievement Awards, the winners of which will be announced at a gala dinner on 25 January. The awards were created to recognise the outstanding achievements of individuals and hospitals, departments or teams that have contributed to the growth and development of the quality of the health sector in the Middle East. A new award this year is the Sultan Bin Abdulaziz Humanitarian City Award for excellence in rehabilitation services clearly recognising the alarming increase of various disabilities throughout the region. It looks to be an exciting battle with Hamad Medical Corporation, Al Ain Hospital and National Commercial Bank all hoping for this top honour.